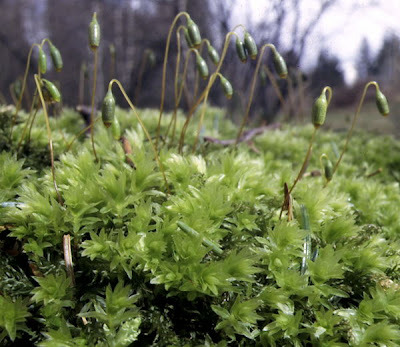 The Mniaceae are a family of mosses, with representatives known as thread-mosses and thyme-mosses, with their main diversity in the northern temperate zone. Members of Mniaceae can be distinguished from many (but not all) species of the similar Bryaceae by the absence in the former of comal tufts of leaves (Watson & Dallwitz). Members of the genus Mnium are usually tall and robust mosses with large leaves that often have a distinct border (Dixon 1924). Characters (from Smith & Smith 2004): Dioicous or synoicous. All stems erect or fertile stems erect and sterile stems procumbent or arcuate; central strand present. Leaves pellucid, ovate to linear-lanceolate, acuminate to rounded; margins unbordered or with one- to several-stratose border, entire or dentate with single or double teeth; costa with stereid band in section; cells more or less quadrate to linear, smooth, sometimes in divergent rows. Female inflorescences bud-like, males discoid or not. Sporophytes sometimes more than one per perichaetium; setae long; capsules cernuous to pendulous, ovoid to cylindrical; peristome double; calyptrae cucullate. [M08] Marstaller, R. 2008. Moosgesellschaften am Südrand des Kyffhäusergebirges bei Bad Frankenhausen (Kyffhäuserkreis). 130. Beitrag zur Moosvegetation Thüringens. Mauritiana 20 (2): 289–348. [M49] Martin, W. 1949. Distribution of the mosses indigenous to New Zealand (supplement no. 1). Transactions and Proceedings of the Royal Society of New Zealand 77 (3): 355–360. Smith, A. J. E., & R. Smith. 2004. The Moss Flora of Britain and Ireland, 2nd ed. Cambridge University Press. [SF01] Stech, M., & W. Frey. 2001. CpDNA-relationship and classification of the liverworts (Hepaticophytina, Bryophyta). Nova Hedwigia 72 (1–2): 45–58. [W79] Wiley, E. O. 1979. An annotated Linnean hierarchy, with comments on natural taxa and competing systems. Systematic Zoology 28 (3): 308–337.